The Wild Hearts cafe concert series is designed to bring chamber music to the Inner West café culture and attract locals to go out and hear live music whilst sampling the local cuisine. Those who may have never attended a classical concert, can do so in a relaxed and friendly atmosphere, where interaction amongst musicians and audience members is very much welcomed! The Series aims to offer top-notch performances, featuring local professionals playing music they love , in an intimate and refreshing concert experience. Also, it will provide a community-development experience through partnerships with local business and artists. The series had it's inaugural concert yesterday , Friday 25th Jan at 6:30pm. The program was presented by the founders of the new Five Dock based concert series , Guivio duo , which comprises of Victoria Jacono-Gilmovich on violin and Giuseppe Zangari on guitar. 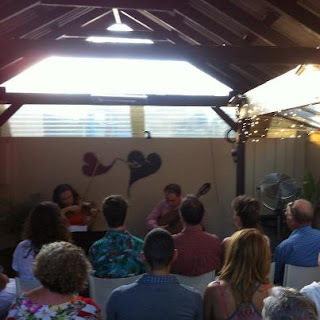 The program included an eclectic selection of works for violin and guitar, fusing French, Italian and Latin classics together with newly composed Australian compositions. Guivio Duo recently performed the World Premiere of a piece written for them by Australian composer Christopher Keane, called Continuum , which was also performed at the concert. Most of the audience members stayed back for delicious meals prepared by the staff at Wild Hearts cafe , and strangers joined tables to converse together and make new acquaintances. Giuseppe and Victoria also stayed back to enjoy dinner and mingle with the guests..It was a lovely night!